Circa 1891 outside row stander from the Charles Looff carousel factory in Brooklyn, NY. 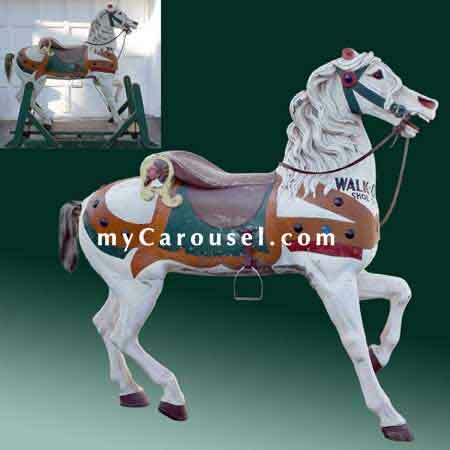 Likely from a New England area carousel, this example of Charles Looff's distinctive early style is mounted on a rocking stand befitting its employment - post carousel - as a treasured feature in the WalkOver Shoes Workers' Social Club in Brockton, MA and later, until the 1960's, as a star attraction in the company's main store in the Campello section of the city. Presenting in old paint, the large horse carries a saddle having a volute cantle on which appears the head of a bearded gentleman, the whole resting on a fringed saddle blanket. Carved fringe and glass jewels appear on the breast band, shoulder straps and breeching. Serpentine mane tendrils cascade down the erect neck and an unusually long forelock falls over the face. Glass eyes and natural horsehair tail. Note the lettering "WALKOVER SHOE STORE" painted on the breast. The horse measures 50 long x 59 high, 48 chest to rump. Total measurement including stand is 60 long x 66 high x 20 deep.